Following the news that Mother Agnes Miriam, a nun who heads the Musalaha (reconciliation) initiative in Syria, was due to speak at the Stop The War conference in London, two journalists also due to speak at the event, Jeremy Scahill and Owen Jones, decided to withdraw participation unless Mother Agnes was removed from the speaking list. At the time of writing, neither “journalist” has offered to explain their act of public censure and decision to bolster Zionist-led smear campaigns; aside from a few tweets expressing their “concern” over sharing a platform with an evil Assad-supporting nun. It seems baseless conspiracy theories are more than acceptable in the higher echelons of “professional” journalism, as long as the target of said conspiracy is a supporter of an enemy state of the west and Israel. The justification for this blatant act of censorship came in the form of a crass campaign of smear and character assassination. One primarily led by outright Israeli/Neo-Conservative propagandist-extraordinaire Michael D. Weiss, a former Director of a now defunct Zionist pressure group called Just Journalism, whose stated goals included focusing on “how Israel and Middle East issues are reported in the UK media.” Weiss, also a former fellow at the Neo-Conservative war-lobby “think-tank” the Henry Jackson Society, is now a lead rebel advocate pimping his “expertise” at Saudi Arabia/Hariri propaganda outlet NOW Lebanon – all whilst writing up US military intervention proposals for the Syrian opposition. It is also no coincidence that Mr. Weiss was a lead proponent of the fairy-tale narratives of one Liz OBagy, an utter fraud sanitizing the image of the rebels on behalf of a US State Department funded rebel lobbying group and the equally hawkish Neo-Conservative PR outlet The Institute for the Study of War. Needless to say, Weiss, and his cabal of pro-rebel Hariri propagandists and Zionist apologists are more than pleased at Jones and Scahill’s somewhat orchestrated decision to pressure Stop the War into dropping Mother Agnes. Mother Agnes, according to the plethora of pro-rebel US and Zionist media accounts, is an evil “Assad apologist”. As a result of Agnes’ support of the Syrian government and calls for peaceful reconciliation, the Al Qaeda apologists rife within western and Israeli media took it upon themselves to instigate a campaign of hatred-filled smear and baseless accusation. Since the onset of the Syrian conflict, Mother Agnes has made efforts to combat the skewed narratives emerging from corrupt western, Israeli, and Gulf Oil and Gas media – not least regarding the controversial issue of the alleged chemical weapons attacks in Ghouta, Damascus. Contrary to the smears, Agnes doesn’t deny people died during the incident, nor offer a complete alternative narrative. Her questions surrounding the event are entirely focused on the many inconsistencies and inaccuracies within the “official narrative” and the dubious YouTube videos touted as impartial evidence. It seems the CIA were also less than convinced of the US governments “assessment”; so much so that a mass resignation was threatened if their name was attached to John Kerry’s dodgy dossier. Furthermore, a considerable open source collaborative effort to determine the perpetrator of the alleged chemical weapons attack has drawn the logical, and somewhat scientific conclusion that only the rebels could have been responsible. In addition, the much politicised UN report that attempted to point the finger at the Syrian army has also come under much scrutiny from highly qualified avenues for its poor methodologies and misleading conclusions. 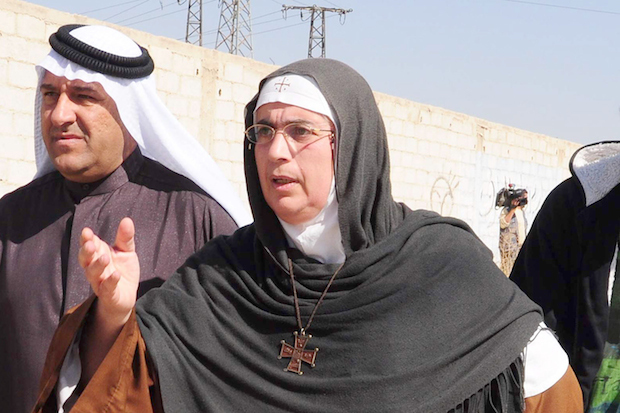 Regardless of all the above, the fact Mother Agnes actually resides in Syria, is the head of an organisation that has mediated between warring factions and enabled the safe evacuation of civilians, and consistently calls for peaceful reconciliation and dialogue, doesn’t count for much in the eyes of rabid western pundits eager to demonize anyone that dare question, or offer a counter narrative to their fabrication-laden fantasies on Syria. The self-described “leftist” UK political commentator Owen Jones has written virtually nothing on the Syrian conflict. His understanding of events is largely based on the dominant narratives portrayed in western media. No doubt, like any self-respecting petty bourgeois leftist of London, Jones gets his information from the wests supposed liberal establishment newspapers, who in recent years have stood proudly alongside right-wing media in cheerleading for disastrous western-led wars of aggression. The conflict in Syria has been no exception, the Guardian’s totally skewed coverage, that lends more from Whitehall/CIA/Mossad talking points than it does reality, has been well documented and debunked. Accordingly, Jones’ ideas on Syria fall in line with this narrative: yes, the “Islamist rebels” are BAD guys (meaning there are some GOOD moderate guys that nobody can find yet, or, in Owen’s case even name), but Assad is a dictator, a war criminal, “barbarous”, “he needs to go”. Any reflection on cause and effect; the long and relevant historical context of US-led subversion and instigation of terrorist insurgencies in the name of “revolution”; or the underlying geopolitical dynamics that helped to create and exacerbate the extremist-led insurgency is far too much nuance for Jones’ simplistic binary narratives: Assad is BAD, and anyone that supports the Syrian government or refuses to support its ouster through coercion or violence is also BAD, by definition. What then, do Jones’ simplistic definitions mean for the millions of Syrians that still support their President and government? Well, like the nun, they are obviously evil and severely misguided. I mean, what would they know, Living in Syria and all? This stance of vulgar superiority is indicative of the vast undercurrent of western bourgeois Orientalism which still oozes from the pores of western media and its decrepit “journalists” when their stance on “others” threatens to detriment their self-imposed “credibility”. Jones is a member and supporter of the Labour party, and thinks other lefties should be as well. As is hardly a secret, Labour is a party that plays host to plenty of major war criminals and apologists for those war criminals, but that apparently isn’t enough for him to want to part ways with them. Indeed, he has in the past quite happily appeared on platforms with John Prescott, who was deputy Prime Minister at the time of the aggression against Iraq – not just an apologist for war crimes then, but an active participant in them. Yet this predicament seems completely lost on Jones. In one instance, he is a paid-up member of a UK political party that played a lead role in no less than genocide; in an act of military and economic aggression on Iraq totally against International Law, not to mention morality. He sits beside these politicians and pleads with leftist thinkers to join them and “change them from within”. A million or so Iraqi lives can be forgotten, there’s a few good eggs in this elitist manifestation of conciliatory Mensheviks, join us! But when it comes to possibly sharing a stage with a nun from Syria who happens to support her government and army in its fight against a foreign-funded, foreign instigated, foreign-led, and extremist dominated terrorist insurgency, Jones wont be part of it. This bourgeois trait of selective free-speech through groupthink coercion is indicative of just how corrupt the western media system truly is. Supposed “leftist” anti-war commentators now feel they are an authority to dictate and pressure who should be able to participate in public events, and wilfully swallow the smears of Zionist propagandists rather than do their own research, or, heaven forbid, judge people on the content of what they are actually saying. Evidently, Jones’ moral outrage is selective at best, one could convincingly argue its nothing more than careerist popularism – with a dash of orientalist superiority for good measure. Sure, sit next to war-criminals of “our” variety, you wont get smeared with the dreaded “apologist” brush in the elitist media you participate and benefit from – hell, most of their “barbarous” crimes are long forgotten, so not much to worry about. But sit next to a nun that supports a current enemy of the west? Forget it. Stop the War have just released a statement confirming that Mother Agnes has “withdrawn” from the conference. Cheers to Zionist apologists of the apartheid state, propagandists of an Al Qaeda insurgency in Syria, and Owen Jones.